228 pages | 11 B/W Illus. Since the middle of the last century tourism has demonstrated almost continual growth, with international tourist arrivals now recorded in excess of one billion per annum. Given the global socio-economic significance of tourism, it is imperative to develop educational opportunities for those working in tourism-related industries. These opportunities should fulfil the changing needs of both industry, travellers, and the learners themselves. While the concept of lifelong learning in the tourism industry plays an important role, it has received little academic attention to date. 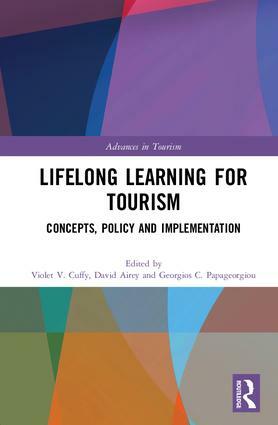 This book provides a theoretical overview of lifelong learning for tourism, exploring its history, practice, and conceptualization. It demonstrates the importance of lifelong learning for tourism from a variety of perspectives, drawing on educational, industry, policy, and socio-economic insights. The book explores managerial and political implications, critical issues, best practice examples, and draws on a range of international case studies to demonstrate theory in practice. Finally, it offers a conceptual framework for future curriculum approaches. This book will be of interest to students, scholars, and practitioners of tourism studies, hospitality, business and management, and international development. It will also appeal to those interested in adult education, vocational training, professional development, and pedagogy. 4. Returning to education: a stressful experience? Violet V. Cuffy is a Senior Lecturer in Tourism and Events Management at the University of Bedfordshire, UK. She is a former Commonwealth Scholar and former scholar of the Organisation of American States. She holds strong research interests in Island Tourism, Carnival Tourism, Tourism Heritage and Culture; Diaspora Tourism, Destination Development and Marketing, Tourism Policy and Product Development, Tourism Education and Training, and Lifelong Learning. David Airey is Emeritus Professor of the University of Surrey, UK. In 2006, he received the United Nations World Tourism Organization’s Ulysses Prize for his work in the creation and dissemination of knowledge. Since retiring from his full-time position at Surrey, he has continued to teach, research, and write, based both in the UK and internationally, where he holds a number of visiting professorships. Georgios C. Papageorgiou is Associate Professor and Head of the International Tourism and Hospitality Management department at Deree – the American College of Greece. His research interests include tourism education management, tourism policy planning and development, tourism marketing, qualitative research methodologies, and the relationship between tourism and popular culture – in particular music, film and literature.